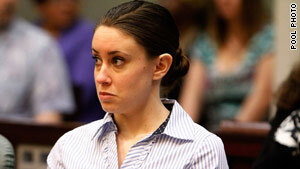 Casey Anthony, 24, is accused of killing 2-year-old daughter Caylee, who disappeared in June 2008. Document: Death occurred during aggravated child abuse, was "heinous, atrocious"
(CNN) -- Florida prosecutors on Thursday revealed a list of reasons they're seeking the death penalty against Casey Anthony, who is charged with killing her daughter, Caylee. Under Florida, law, prosecutors need to raise only one of 15 possible aggravating factors to support their decision to seek the death penalty. Assistant State Attorney Jeffrey Ashton cited five circumstances, according to a document obtained by CNN affiliate WESH and other Orlando, Florida, media outlets. In death penalty cases, jurors are asked to weigh aggravating circumstances that make a crime especially heinous against mitigating factors that favor mercy, such as a lack of prior offenses. Among the legal reasons cited: Caylee's death occurred during aggravated child abuse, was especially "heinous, atrocious, or cruel," and was committed in a "cold, calculated and premeditated manner without any pretense of moral or legal justification," according to the document. Caylee was also under 12 years old, and Anthony "stood in a position of familial or custodial authority over her," the document states. Karen Levey, the court public information officer, could not confirm that Judge Belvin Perry Jr. received a copy of the notice. As of Thursday evening, defense attorney Jose Baez said he had not been served with the notice. In a hearing this week, Perry ordered the State Attorney's Office to disclose the aggravating factors they intend to cite in a penalty phase if Anthony is convicted of premeditated murder. Anthony, 24, is accused of killing 2-year-old Caylee, who disappeared in June 2008. Her body was found that December in a vacant lot near her grandparents' home in Orlando. Defense lawyers have said that prosecutors are seeking the death penalty to bankrupt the defense and prevent Anthony from having the attorney of her choice. The defense said that prosecutors had originally said they would not seek death in the case but reversed that position in March 2009 when they learned that Anthony had $205,000 for her defense. The bulk of the money came from ABC News for the licensing of photos and videos, Baez testified during a previous hearing. Anthony's trial is scheduled to begin May 9, 2011.